Now that its winter here in Australia (& maybe because I am getting older!) I am finding it necessary to moisturise my tootsies to keep them in strappy shoe shape all year round. 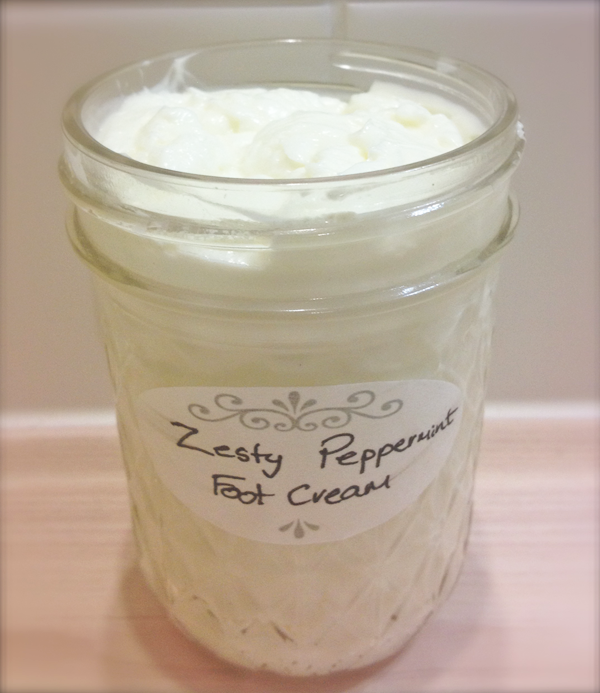 So instead of buying a foot lotion that is filled with all sorts of nasties I decided to make me own & the recipe was such a roaring success I have decided to share it with you all. This lotion is light, fluffy & super easy to make. It is slightly greasy & doesn’t disappear into your skin, but leaves a nice slight barrier that gives your tootsies a nice glow about them. Never fear though its not so greasy that you can only apply it at night with socks!. I have been applying mine after showering & then waiting ten minutes to put my shoes on & have found that my skin absorbs it nicely. And my tootsies? Well they are looking ten years younger – at least!! Actually I have a confession to make, I love this lotion so much I have made it with Rose Geranium essential oil instead of peppermint & have a large jar of it on my bathroom counter as a post shaving balm, hand cream, elbow & even dare I say it face cream!! I love this stuff!! So experiment with it, you may find you want to make several pots of it with different scents & use it as your go to lotion like we currently are. The easiest way I have found to make lotions at home is to use two mason jars & place them in a pot of simmering water. Heat both jars in your simmering water until the contents of jar 1 have melted & mixed together. Take your jars off the heat & pour the contents of jar 1 into a blender, or stick blender container, blend your mix as you add in the liquid ingredients from jar 2. Blend your lotion for at least 3 minutes continuously. It should start to thicken as it cools, keep blending it from time to time to ensure that your lotion stays nice & whipped. Once your lotion feels like it is at body temperature add your essential oils & blend one last time. 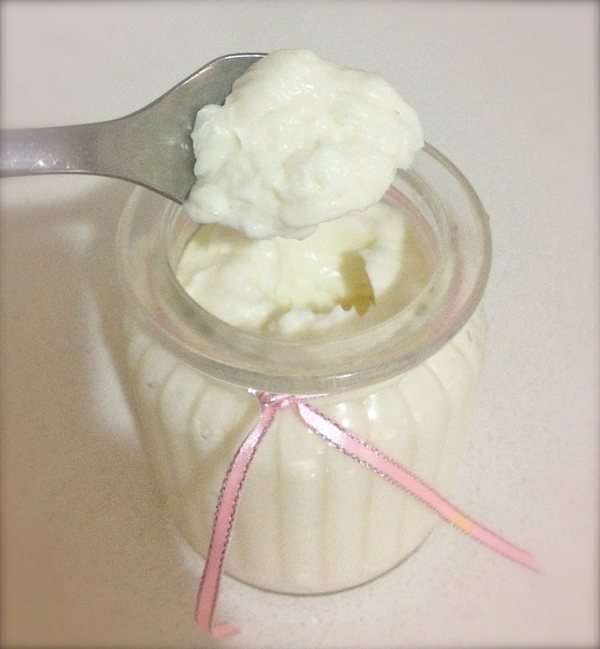 Pour into clean jars & keep the bulk of your lotion in the fridge as it has no preservative & will go off otherwise. We keep a small jar on the bathroom bench & the rest in the fridge & just keep topping up our counter jar. Have fun with this lotion & experiment with your essential oil blends, trust me you will love this stuff! 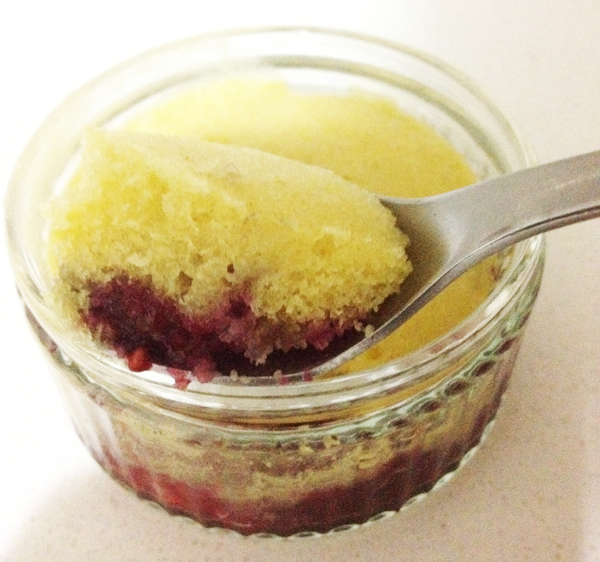 Steamed puddings remind me of being a child & that has to be a good thing, right! Cold winter evenings, a pot of boiling water on the stove with the cake pan simmering away, wafts of vanilla taunting us throughout the house, scorching your fingers with the steam in your hurry to remove the alfoil & see if the cake is ready to be devoured. Those are the memories of my childhood, delicious steamed puddings & scorched fingers. And I am very sad to admit that in my old age I have not become any wiser, I am sporting some nice scorched fingertips as I type this :). You will see that the recipe calls for leaving the cakes to cool for five minutes on the bench before removing the alfoil, but in my hurry to check they were ready (read: taste test them) I of course ripped the alfoil off straight away & scorched my poor fingers – but the warm rich vanilla cake with decadent berries was worth it – scorched fingers & all. Beat butter & sugar till pale & creamy, add egg, vanilla extract & milk, mix well. Stir in flour & baking powder gently until just mixed. Take 6 small ramekins or stainless steel bowls & divide the berries equally amongst them, add one teaspoon of coconut sugar to the top of each ramekin. Divide your cake batter evenly over the top of the berries & sugar, leaving enough space for your batter to double in size. 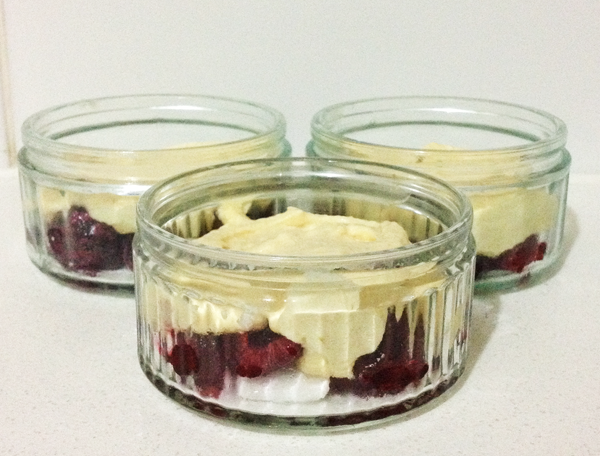 Cover the top of each ramekin with alfoil. 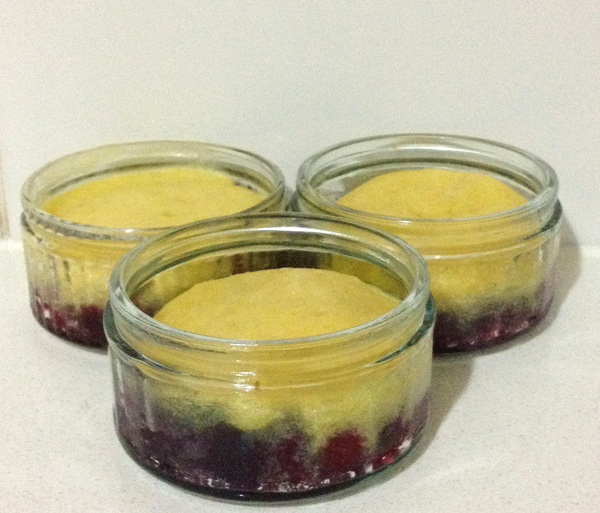 You can steam these cakes in a pan of boiling water for 20 minutes by sitting your ramekins in a pot of boiling water, ensuring that the water does not come up to the top of your ramekins, leave to boil with the lid on for approximately 15 minutes. Or you can steam them in your Thermomix on the Varoma setting for 20 minutes. Once your puddings are steamed, take them out & leave them on the bench still covered in foil for an additional five minutes to ensure they are well cooked.